The monogram was designed by Johann Sebastian Bach himself. In it his initials, JSB, and their mirror images are woven together. 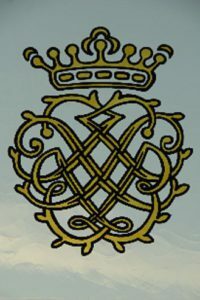 The monogram was made in stained glass for Wim Roelfsema by Beckers Glas-in-lood Atelier, Arnhem.